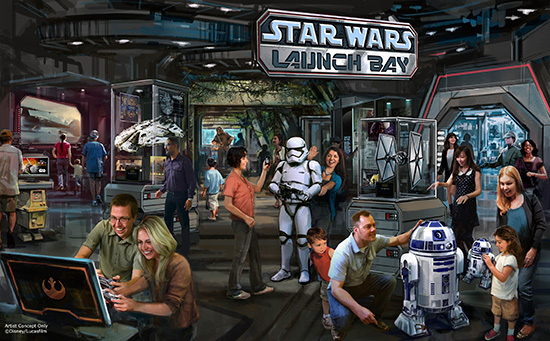 The Star Wars Launch Bay will be the centerpiece of Season of the Force and it’ll be where guests can meet the characters and get a sneak peek at Star Wars: The Force Awakens. In December a new Jedi Training experience, Trials of the Temple, will debut. It will feature new characters and a new villain from Star Wars Rebels. 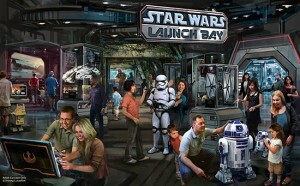 Space Mountain will also be reimagined at Hyperspace Mountain for a limited time. In order to make room for the new Star Wars-themed land several areas at Disneyland will close at the end of the day on January 10, 2016. These areas are: the Disneyland Railroad, Fantasmic!, Mark Twain Riverboat and Sailing Ship Columbia, Pirate’s Lair on Tom Sawyer Island, and Davy Crockett Express Canoes. All of these attractions will reopen at a later date. The Big Thunder Ranch – which includes the Big Thunder Ranch Railroad, Big Thunder Ranch Petting Farm, and the Big Thunder Ranch Jamboree – will close permanently at the end of operation on January 10, 2016.